I had kind of a bummer of a day–some unexpected sorrow and a lot of regular, ordinary frustration. I freely admit that most of the frustration was self-inflicted. I began the day by leaving my cell phone at home and ended it by leaving a flash drive stuck in my computer at the Woodson. I can’t write about what I meant to write about, and I’m tired, hungry, and frankly a little cranky. That’s Rice President George Rupp and long-time Rice physics professor Neal Lane. The date on the back is October 1985, but I’m not totally confident about that. If it’s right, it was very early in Rupp’s presidency–in fact, it might have been taken at the time of his inauguration, which took place on October 25th. Neal would have still been serving as Chancellor of the University of Colorado at Colorado Springs. By 1986 he would be back at Rice as our provost, a job he held with honor and integrity until 1993, when he left to become director of the National Science Foundation and then the President’s Science Advisor in the Clinton White House. 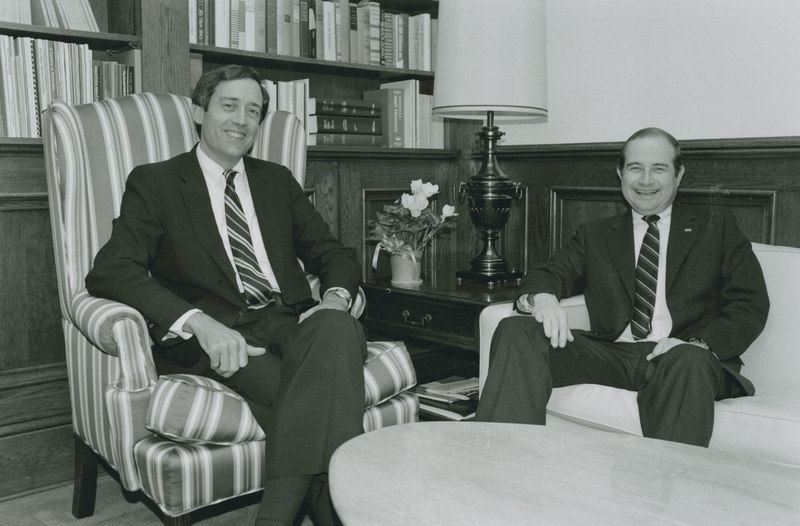 Rupp also left Rice in 1993, and later served with great distinction as President of Columbia University and then as head of the International Rescue Committee. I love this picture. I love it for reasons that are too complicated and too ineffable to describe in a blog post. But I will say this: Zoom in. What you’ll see looks for all the world like genuine happiness. Now I will have a glass of wine and some pizza. And go out and lick ’em tomorrow.